[Update: September 18, 2017] e-people Official Korean Government Response: baffling – blame shifting – unprofessional. Home / Blog / [Update: September 18, 2017] e-people Official Korean Government Response: baffling – blame shifting – unprofessional. 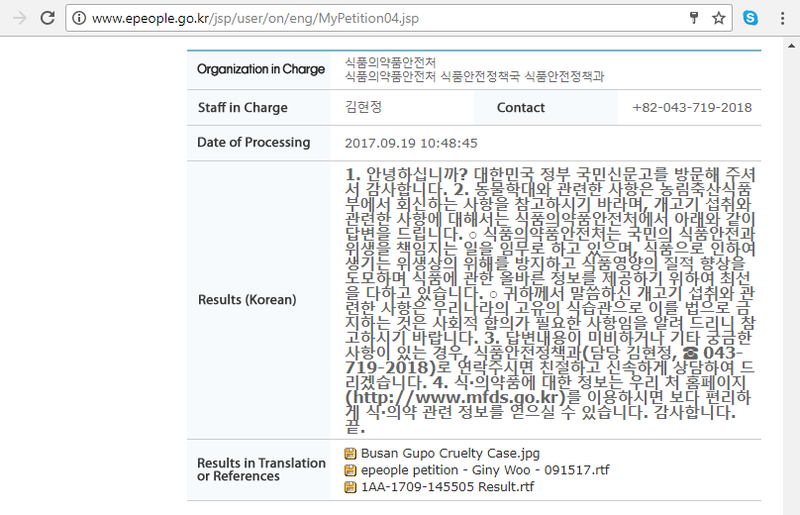 We received a response from a petition submission regarding the Busan Gupo Market Cruelty Case to the Korean Government’s e-people web site; it answered none of our concerns, made little sense and shifted responsibility to other Government offices. The reply was not what we should expect from any official main government-operated site that invites comment from the public, and especially not from the Government of such a wealthy, highly educated country. The least that we should expect is a reasonable, coherent and informed response to our legitimate concerns. Click HERE for our campaign. Results: 1. We thank you for your petition posted on e-People. 2. With regard to your queries about animal persecution, please refer to a response from the Ministry of Agriculture, Food and Rural Affairs. We at Ministry of Food and Drug Safety provides our reply to issue of eating dog meat. ○ Ministry of Food and Drug Safety is responsible for the safety and sanitation of foods, and is dedicated to preventing food safety hazards, promoting qualitative improvement of foods and nutrition, and providing correct information on foods. ○ Issues regarding eating dog meat as you mentioned is a unique eating habit of Korea. Please be informed that prohibition of such habit by laws calls for social consensus. 3. Should you need further assistance, please contact Kim Hyeon-jeong, Food Policy Coordination Division (☎ 043-719-2018). 4. For information regarding foods and drugs, please visit our website (http://www.mfds.go.kr). Thank you. This is horrific and disgusting way to treat family pets. This is animal abuse and animal cruelty. This person or these people who torture dogs should be tortured themselves and thrown in jail. This dog eating custom has to be stopped. Dogs have feelings and we are supposed to be their protectors. It is the 21st century. If you choose to eat animals (I don’t – I am vegetarian) you should at least slaughter them in a way that is not unnecessarily cruel. Dog slaughter in the Busan Gupo market, by the way, seems to be unhygienic as well as inhuman., In this case the Korean Ministry of Food and Drug Safety is obviously failing to carry out its duty of (I quote) being “responsible for the safety and sanitation of foods”. If Koreans wish to continue to eat dog meat please ensure the animals are killed in abattoirs where vets are in attendance and laws for animal welfare are applied, so that the dogs are killed in as humane a way as possible. Cases of flagrant and disgusting cruelty to dogs, as in the Busan Gupo Market, give a bad impression of Korea and Korean people. If you wish to improve Korea’s international standing you should act immediately to stop killing dogs in such vile, cruel and uncivilised ways. This total disregard for the horrific torture and slaughter of these innocent cats and dogs is beyond repulsive. This vile holocaust is a blight on your country and you are refusing to do anything to change this. Truly despicable. These are God’s creatures. You and others will pay for what you criminals have done and continue to do. They belong to him. The people of South Korea – and I include those in power who could put an end to this ” trade ” – are nothing more than evil, monstrous, repulsive, heinous, slimy scum & how I wish the same – if not horrifically worse – should happen to them and all their relatives!!! May they ultimately rot in hell!!!! ITS 2017 EVOLVE ALREADY EATINGDOG AND CAT MAKES YOU UNCIVILIZED HUMANS, INHUMANE, AND LOW CLASS!!! This barbaric, cruel practice makes Korean people look lowly and barely better than cannibals. Many nations and cultures have had repulsive, evil practices that were claimed to be “just part of their culture”. But such practices were ended, because courageous people exposed them for what they truly were–cruel, evil, wrong-headed, backward-thinking behavior. So must the Korean do the same with this repulsive practice of dog & cat butchery and consumption. And this needs to happen NOW!